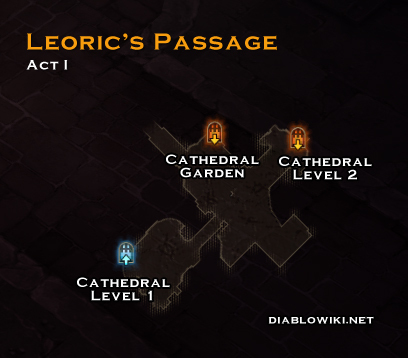 Leoric's Passage lay beneath the Cathedral Garden and level 1 of the Cathedral. It's a single storey dungeon where on the Legacy of Cain quest you will encounter Headcleaver a superunique Skeleton. This page was last edited on 8 January 2013, at 20:34.